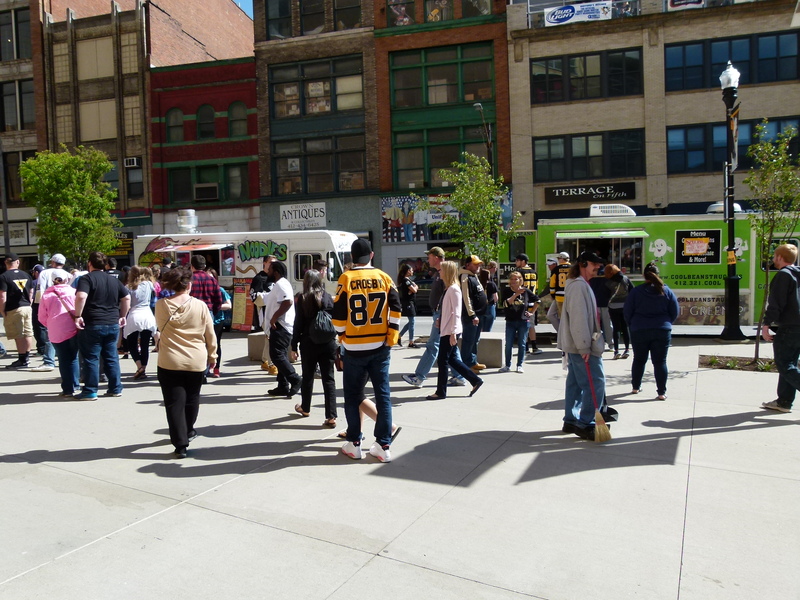 It was a beautiful, sunny day to watch the Pens play the New York Rangers in the fifth game of the first round of the NHL Playoffs on the big screen outside of the Consol. 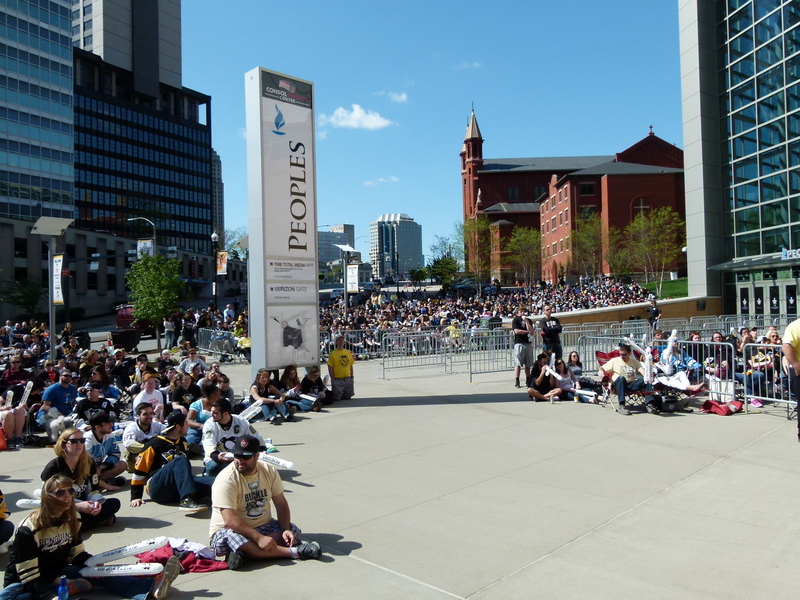 The audience was a diverse group of people who had assembled to enjoy the game and have some fun. 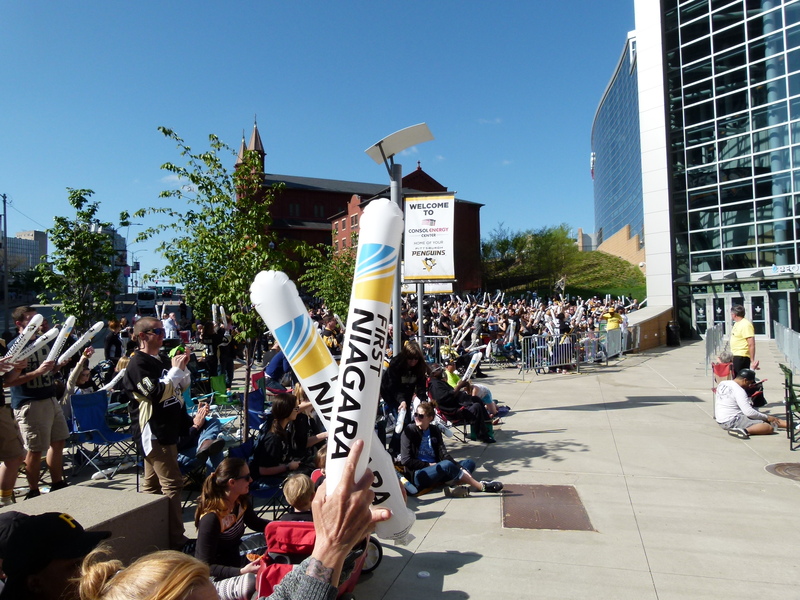 Free Penguin clappers were given out to all that wanted them. 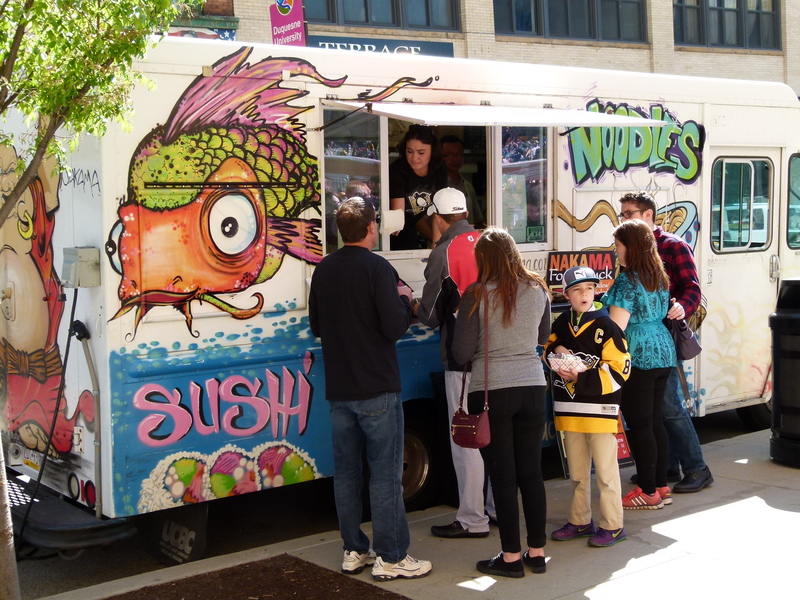 Food options included vendors: TGI Friday’s, Dunkin’ Donuts, Dairy Queen and food trucks from Nakama and Legends of the North Shore. 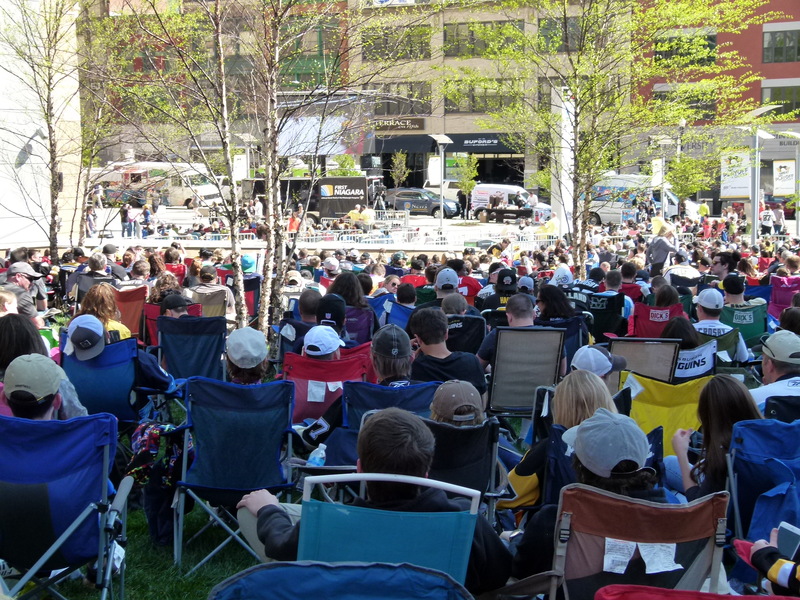 A good time was had by all, especially with the Penguins beating the Rangers handily and heading to the second round of the playoffs. 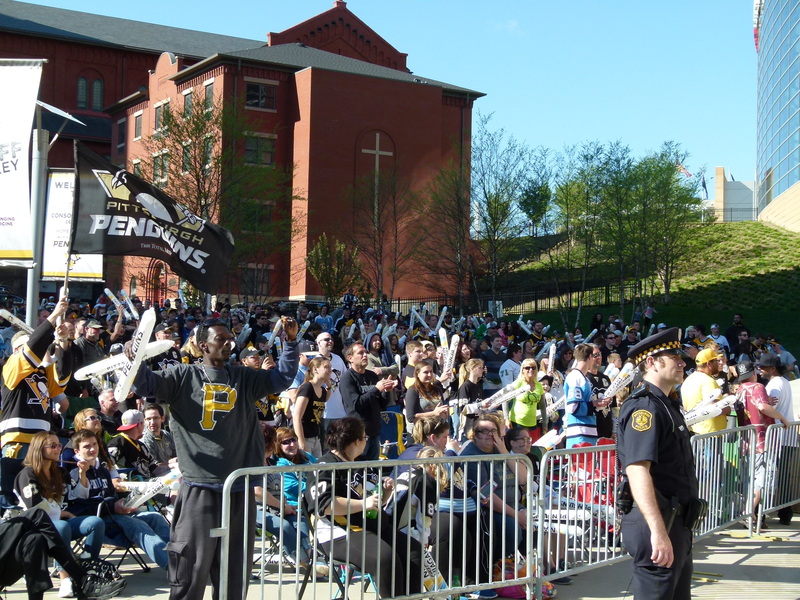 Penguins fans gather outside the Consol Energy Center to watch the Pens play the New York Rangers in game five of the first round of the NHL Playoffs. 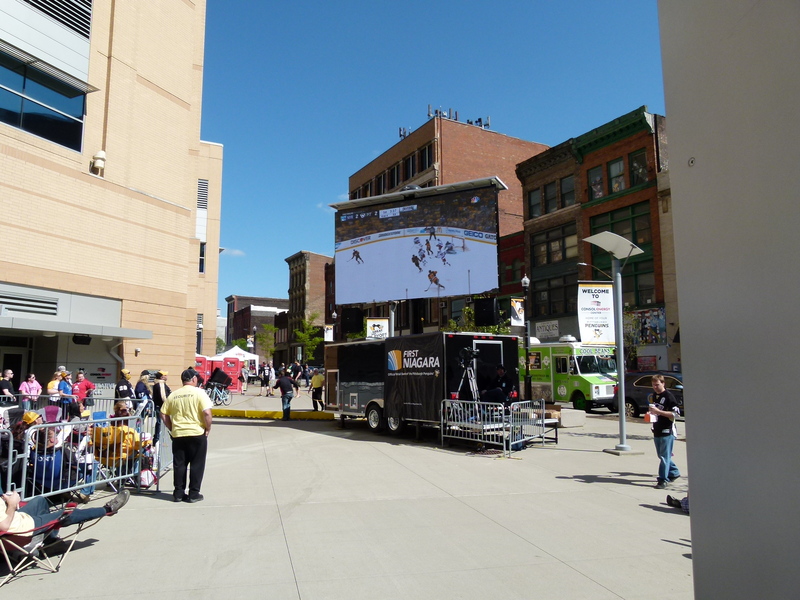 The big video screen showing the action inside the Consol. 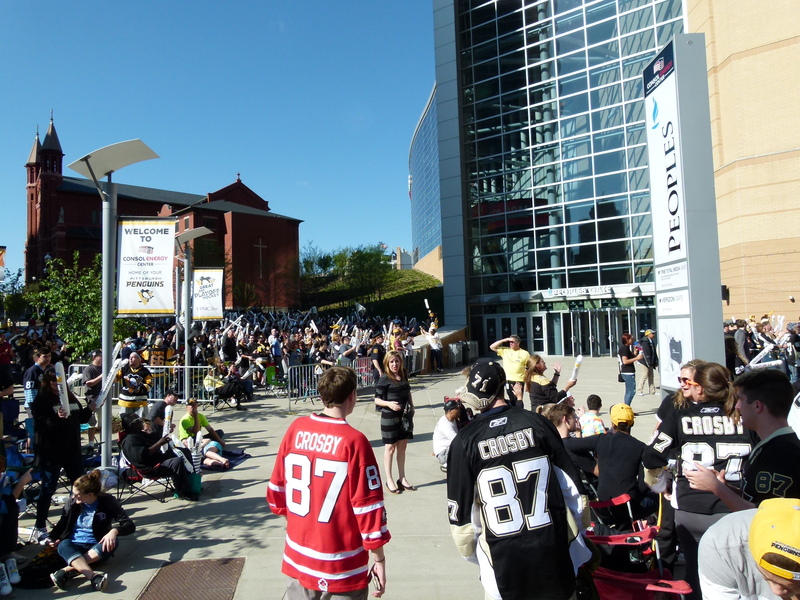 Pens fans were sporting sweaters (jerseys) of their favorite players. 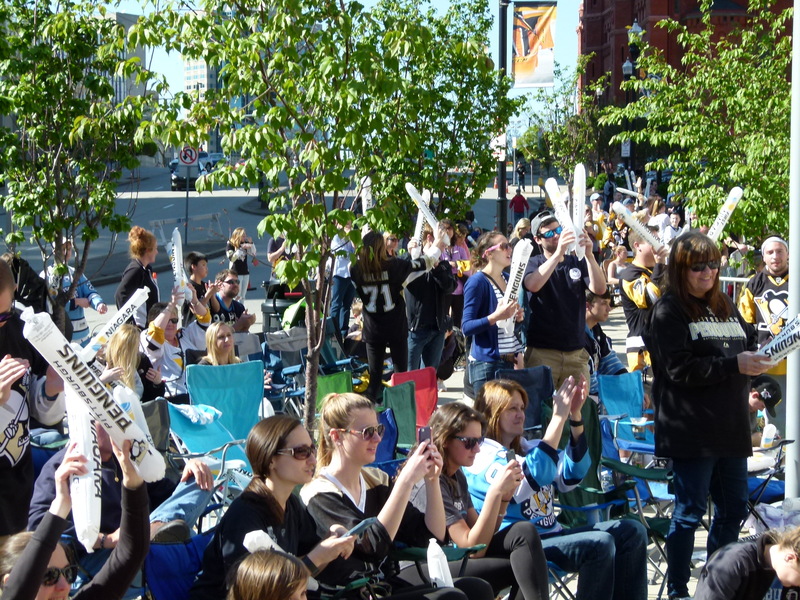 Many in the crowd were wearing Sidney Crosby's. Some people just know how to do it up right. Like Monoreville's Dan and Kelly in their field chairs with extended foot rests. It's never too young to expose children to Pen's culture. Several food choices to ponder. 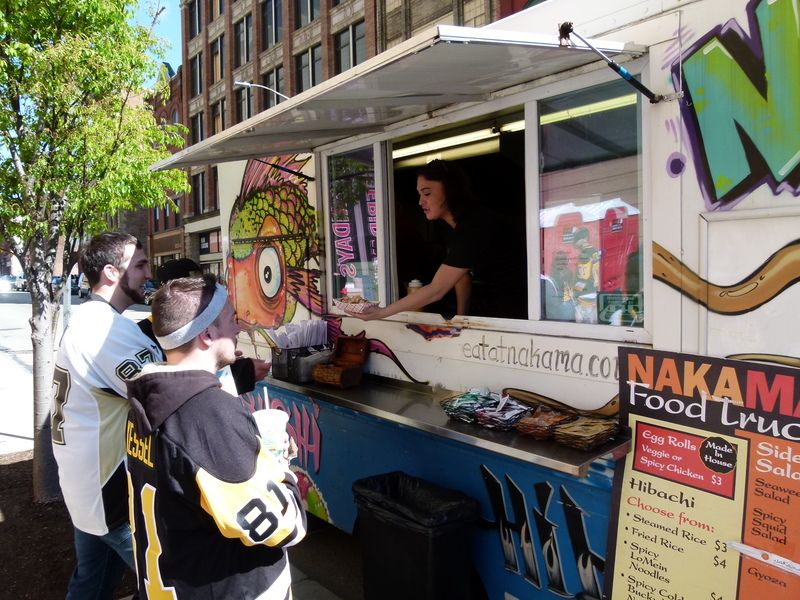 The very colorful and flavorful Nakama food truck. 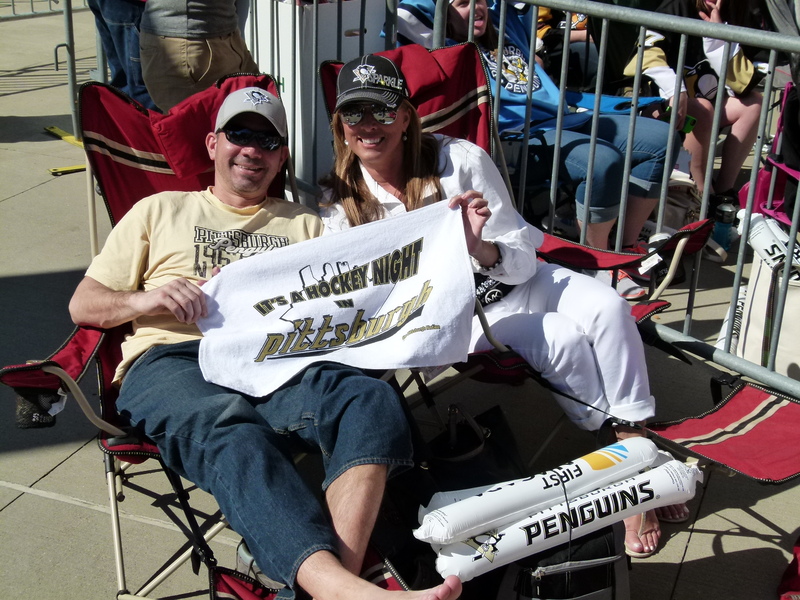 Penguins (fans) love fish. 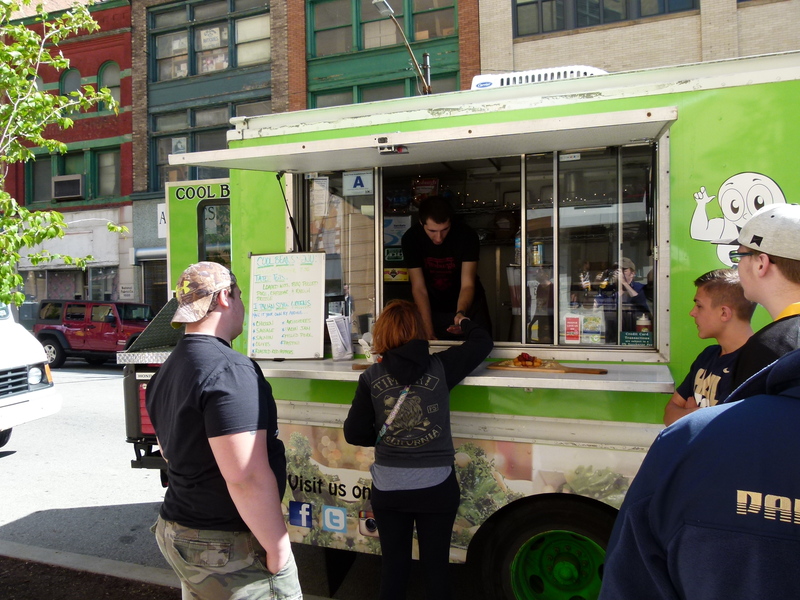 The Cool Beans food truck from Legends of the North Shore restaurant features beans and greens with your choice of protein, and other tasty items. A,J. 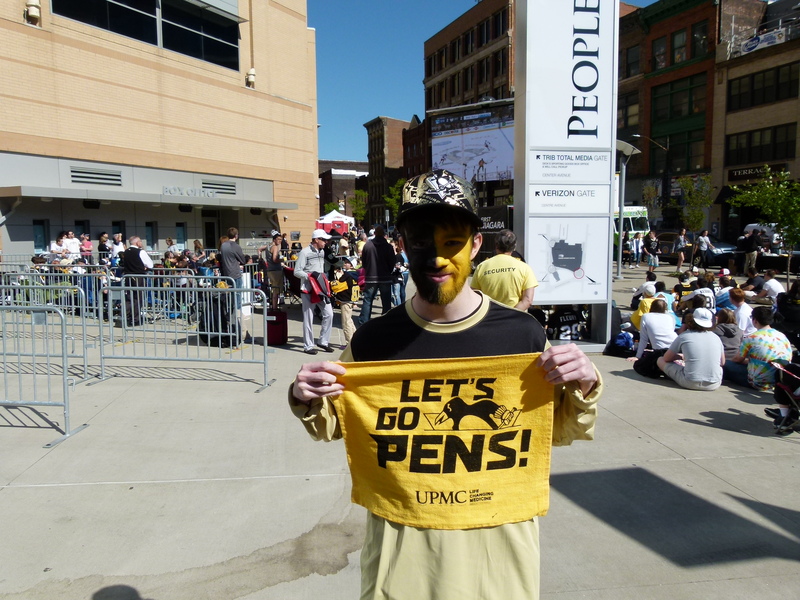 from Monroeville wearing Penguins black and gold on his his clothes and on his face. He is one dedicated fan! 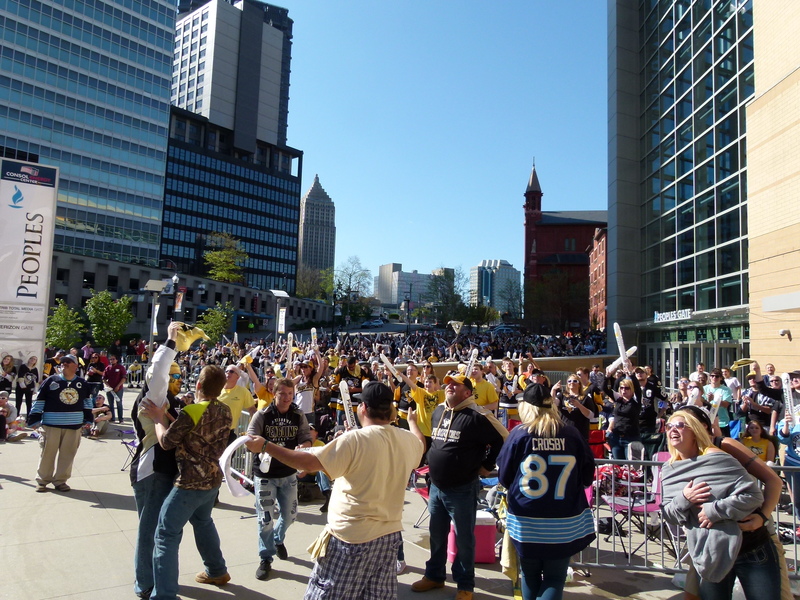 The Pens put another one in the Ranger's net and the fans rejoice. 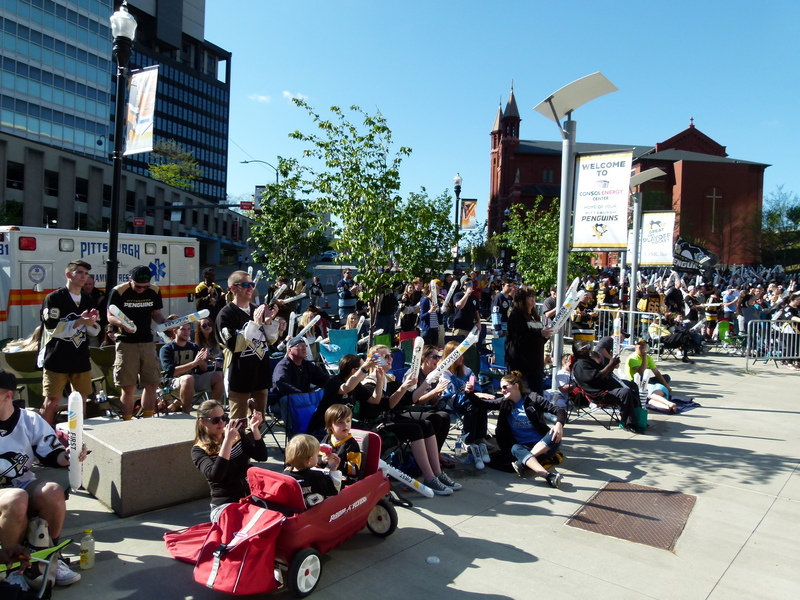 Young fans, including Zac (l.) from Baldwin, enjoy an impromptu play area next to the Consol. Clapper sword fights and throwing the football around were the favorite activities. It's hard to play hockey on a grassy hill. It feels so good to be winning! 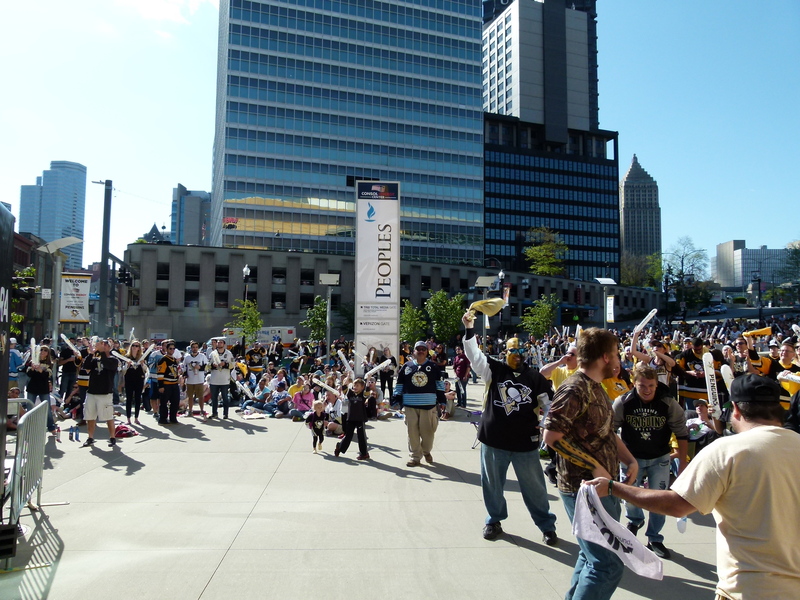 Rick Handler is the executive producer of Entertainment Central and a Pens fan.